I started reading a new blog (Muffin Top to Smokin Hot) recently and she’s inspired me. She’s been struggling and I feel her pain! I have put a lot of weight on over the past few of years and MUST loose it. I am a stress-eater. Food is my security blanket. It’s AMAZING how a single white chocolate baking square makes me feel better. Problem is I can’t live on white chocolate baking squares so I will eat veggies… grape tomatoes and baby carrots are often something I reach for. Downside is that they don’t really have a lot of calories so even though I’m eating them and filling up I haven’t been eating enough. I started keeping a food diary again this week. When I had my previous successes I used DietPower but it is for Windows computers only and I have been using a Mac for 3 years. They don’t have any plans for a Mac version so I had to go somewhere else. It was VERY VERY VERY frustrating because I had used it for YEARS. I had been very successfully, but felt alone. I looked at different Mac programs but wanted something with me when I left the house – this was a problem when I used DietPower, too. Now, I have two iPhone apps, Lose It! (free) and Tap & Track ($3.99). I had started “logs” on both of them in the past and wanted to start fresh. I had planned on using Tap & Track, but couldn’t figure out how to easily start a new plan without wiping everything it had stored, so I took a look at Lose It! and it was pretty straight forward so I’m using it. I’d like to do a comparison of the two so if someone out there knows how to start a new plan or goal or diet without deleting everything in Tap & Track please let me know. I also created online accounts at LoseIt.com and it’s tied to my iPhone app. I can add to my diary from the web or my app. I love the freedom! If you don’t have an iPhone, you can still use their website, but would have to enter your diary via the web. My goal is 2 pounds a week and a total of 80 pounds. OMGosh! That’s so much, but I know I can do it. Lose It! says I should reach my goal by Decmber 28, 2011. Interestingly enough I discovered that I although I was eating healthy foods, I wasn’t eating enough during the day. By 5pm I had only been eating between 700-900 calories. WAY WAY WAY too low! So I added more food. 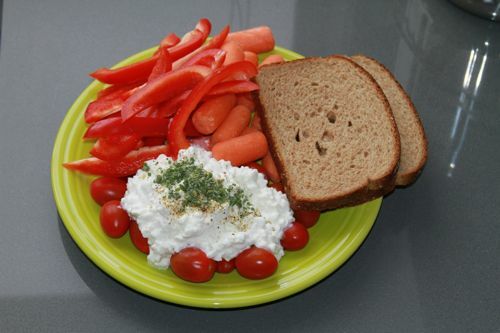 Here is my lunch from yesterday… on the 10-inch plate … one red bell pepper, 6 ounces baby carrots, 8 ounces grape tomatoes, 1 cup low-fat cottage cheese with no-salt seasoning and chives, 2 slices whole wheat bread (no high fructose corn syrup). I eat 5 small meals a day. Lose It! doesn’t let you do it that way, but I combine my two lunches into one. 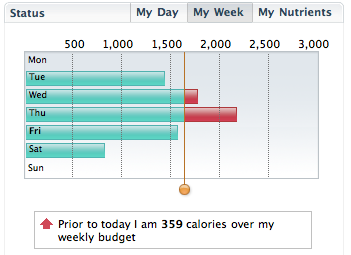 My plan is the same as previous successes… 6 days of careful logging what I eat and Saturday is my free day. Don’t get me wrong, I don’t totally pig out, but give myself permission to not be so strict… like if I want extra dessert or snack it’s OK. It’s my reward for being “good” during the week and logging my food. Since I started journaling on Tuesday this week (four days of journaling)… I have lost 4.5 pounds! I haven’t decreased my food intake or exercised my bum off… I’ve eaten more during the day. I did do a custom 45 minute Wii Fit Plus workout one day and walked at the mall while shopping for 20 minutes, but that’s the extent of the changes. Oh, yeah… also making sure I get 72-80 ounces of water a day, more if I’m working out. Update:Even with going over my target calories two days, I lost 4.5 pounds and kept my nutrients each day near my goals. I also wait 3 hours after eating before going to bed. Please join me in my journey… without any judgement please. so let me get this straight…..you weren’t eating enough – as in – you needed more calories to keep your metabolism going or what? Please explain that to me. I could stand to lose about 35-40 lbs easy! I have zero willpower! Yeah, I wasn’t eating enough during the day. To be at 700-900 calories after 11 hours is way too low. I would eat dinner in the evening, not gorging myself, but hungry. I took a nutrition class a while back (years) and they said that the human body needs 1200 calories minimum to survive; of that 1200 at least 12% must come from fat. I was eating very low fat, 10%. I do that a lot because I eat a lot of veggies. 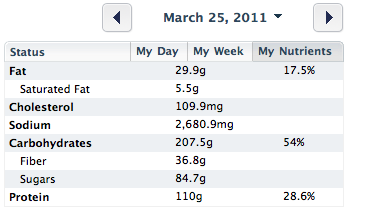 Keeping the food diary it shows me what I’ve eaten calorie-wise as well as percentage fat, carbs and protein. I am shooting for 50% carbs, 30% protein and 20% fat. I shoot for no more than 30% fat on my 6 days, sometimes on my free day I don’t worry about it. I will fluctuate on carbs/protein more than fat. For the most part I stick to 20% fat. 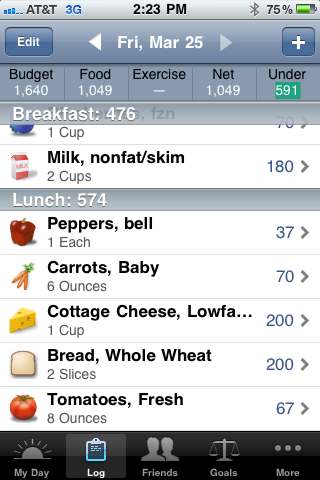 The food diary helps me with that… surprisingly enough it is a struggle. When I don’t watch it, I am closer to 10% which isn’t good. I’ve updated my post to show the nutrients and performance toward goals. I’m a “data driven” person, so these charts and feedback help me. I also do not don’t eat late… I wait 3 hours after eating before going to bed. My aunt said if you don’t eat enough calories that your body will actually HOARD all the calories you put into it because it feels like you are starving it. Way to go with the weight loss and food log! I also log my food on Dr. Oz’s website Sharecare. I started in January. I’ve lost 22.8 lbs with 18 more to go.